According to a classified cable from the US embassy in Skopje which was released by Wikileaks on Monday, the Former Yugoslav Republic of Macedonia (FYROM) was willing to accept the name Republic of Northern Macedonia or Republic of North Macedonia since 2008. 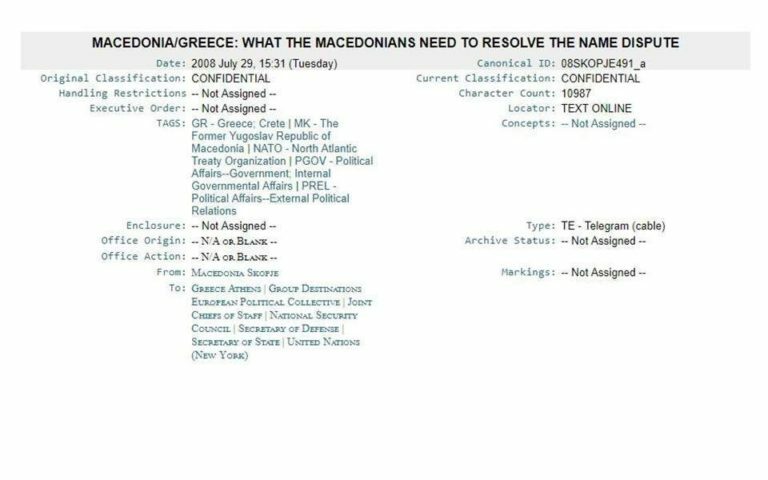 The basic term clarified in the cable titled ‘What the Macedonians need to resolve the name dispute’ and dated July 29, 2008 was to secure the recognition of the “Macedonian” language. The cable compiled by the then US Ambassador to the neighboring country, Gillian Milovanovic was in fact very similar to the joint deal that was signed by FYROM and Greece in the Prespes Lake region back in June. Scope: in all international organizations, plus bilaterally by any country that does not want to use the constitutional name. (Although we have not discussed this explicitly, presumably international agreements would follow the same pattern, with multilateral ones using the new name and bilateral ones having the option.) Macedonia would use its constitutional name in referring to itself, on passports, product labels, in the media, etc. Identity: The language and nationality would be called Macedonian, but this could be handled tacitly, perhaps as a subsequent annex to a UNSCR, or in some other internal UN document not subject to Greek review/approval. Bottom line is Macedonia needs assurance that their language, nationality, etc. would continue to be called Macedonian, not North Macedonian. Meanwhile, Greek opposition leader Kyriakos Mitsotakis reiterated his promise not to sign the deal reached between Skopje and Athens. “Today’s revelation from WikiLeaks, that Skopje had been asking since 2008 to name their country ‘North Macedonia’ and their people ‘Macedonians’ who supposedly speak the ‘Macedonian’ language confirms in the most tragic way what I have been stressing all those months. That [PM Alexis] Tsipras, [Defense Minister Panos] Kammenos and [Foreign Minister Nikos] Kotzias wanted to present their extremely damaging agreement – which satisfied what Skopje had been demanding for years and had been rejected by all previous governments – as a success for Greece,” the New Democracy leader said in a statement. “I reiterate my commitment: New Democracy is not going to ratify this agreement,” he said.